Clear Fork of the Brazos River Suspension Bridge. 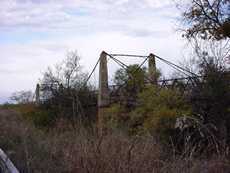 One of the oldest suspension bridges in Texas, this bridge was requested by residents of Young, Shakleford and Throckmorton counties who wanted (and needed) a crossing closer than the bridge at Fort Griffin. The bidding was opened on March 1st, 1896 and the contact was awarded to the Fluice-Moyers Company of Weatherford. The span was to be 140 feet, suspended 40 feet above the river by stone piers. 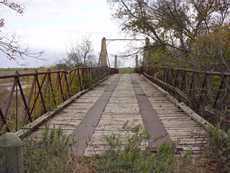 The cost was approximately $4,500 and the bridge was "delivered" in June of 1896. The only visible changes immediately apparent are the piers being covered in concrete. The bridge with additional details of its construction are included in T. Lindsay Baker's Building the Lone Star, available (on demand) from Texas A & M Press. Building the Lone Star was our source for the above information. The Regency suspension bridge information states that it's one of eight remaining suspension bridges.